Cedar Shake Shingles add elegance and longevity to a homes roof. Keeping the shakes cleaned will help them last for many many years. Kleen Roofs uses a soft wash system to safely clean cedar shakes. We perform non-pressure cleaning of cedar shake roofs throughout Michigan. Depending on what is growing on the roof will help us determine what is needed to clean the shakes. 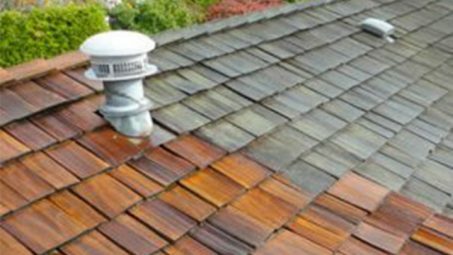 Roofs that have been neglected for a long time will have moss and lichen growing on the shingles and need extra attention to clean. While the use of a power washer to clean cedar roofs was the way to go in the past it is no longer advisable. With the advancements in chemicals and non-pressure cleaning equipment, soft wash cleaning will not damage the soft cedar wood. It may be that the cedar has turned black, or has moss and lichen growing on it. In any case, Kleen Roofs can properly care for your Cedar Shake Roof. They do an awesome job! They even went as far to clean my propane at no charge, thank you, didn’t recognize my house when I pulled up, looks like new. 5 stars. Dave is very responsive and his prices are very competitive. I would definitely recommend to future clients. Just sending a message to say THANKS for an outstanding job!!!!! I Hope my neighbors see the GREAT job you did on my house and give you a call. Feel free to use my name as a reference. Once again GREAT JOB!!!! They did a great job cleaning my siding, at a reasonable price. I would definitely hire them again. This is the best $250.00 I have spent in a very long time. My roof had algae streaks that ruined the curb appeal when trying to sell it. After Kleen was finished it looked like a new roof. Thank you! It really works! I am so pleased with this company! They have cleaned my roof several times as well as power washed my garage. Very professional and reasonably priced. They came out the same day I called and did an amazing job. It is so rare now-a-days to find a company like this! I won’t use anyone else.